It lets us stalk. It lets us get in touch with our past. And it reminds us– in some cases– who we were. And maybe…..still are. I am a graduate of Hunterdon Central High School in Flemington, NJ– Class of 1982. Unlike many people– high school was a haven for me. It was a blissful place where I could be who I was. I was a geeky, weird theater person with a hunger for books and a longing for something “more”. We had a very large theater department. AND believe it or not– a community radio station. It was there, in my freshman year, that I met a graduating senior by the name of Jeff McQuinn. Long haired hippie stoner dude with a killer smile and a gentle spirit. My friend Sandy had a hella crush on him. She refered to him as “Jeffie” McQuinn. What I remember most about him is a story he once told about playing darts in a bar. In order to psyche out his opponent, he stuck his darts in his artificial leg. That story reverberated with me then and now. It’s a touchstone for me– a “f*&K you, I’m stronger than you think I am. I’ve got this “thing”” but it doesn’t bother me”. Embracing a perceived weakness as a strength. oh. wait. Did I forget to mention that Jeff had an artificial leg? He recently came across my Facebook radar and I told him about always remembering that story. And we chatted about this blog and where life leads us. woah woah woah…..wait. Hold on a minute. What? I’m talking about Jeff McQuinn! He doesn’t have a “HANDICAP”!! He’s not “disabled”!! oh wait. He only has one leg. I guess he does. Seriously. I had to pull myself up short. It never occurred to me. He was just Jeff: Long haired hippie stoner dude with a killer smile and a gentle spirit. I am long past thinking of people in terms of handicapped, disabled, autistic, neurotypical, cognitively aware, etc. I realize that I think of people in terms of……..
Who they are. What they do. What they bring to the table. Perhaps I am being a tad insensitive. Perhaps you think I am making light of those that struggle with a physical disability. But I assure you, I am not. I don’t like to define people at all. You ask me which child is mine in Pat’s class. Do I say: “He’s the autistic child with tumors in his brain and epilepsy”? No, I would tell you that he’s the blue eyed, dark hair boy with the sly grin and great laugh. You ask me who was Jeff McQuinn in high school. Do I say: “He was the guy with one leg”? No, I would say he was that long haired guy Sandy had the crush on. The next time that you have to describe somebody to another person– listen closely to your language. Think in terms of their heart, in terms of their deeds, in terms of their worth. The terms autistic, disabled, handicapped, cognitively impaired , etc DO have their place. sweet, kind, talented, righteous, courageous, blue eyed, freckled, funny, etc etc. Think in terms of endearment. THIS, is an open letter to the woman that openly stopped and stared at Jackson at one point in our visit there. I understand that you might have been a little put off or uncomfortable with what you witnessed at the Hill Air Force Air Museum. Let me break it down for you so that you can put it in perspective. My son , Jack, is autistic. 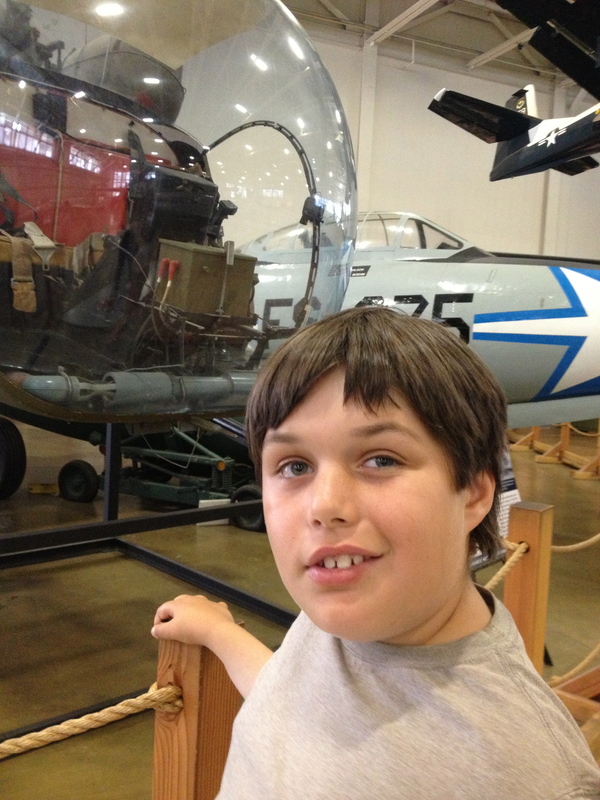 Jack loves, and I mean LOVES, helicopters and airplanes. They are endlessly fascinating to him on many levels. So that day he had reached Nirvana, Vallhalla, and Heaven all rolled into one. It was bonus points that the hangar was cool and not brightly lit. That echo? A big draw, too! And that cool ( to the touch) concrete floor was the coup de gras on that hot summer day. And that is why he yelled (at the top of his lungs) the word FAN. What he did next was a sensory thing. The floor was cool and slick and perfect to push oneself across on one’s back. If YOU were a severely autistic child, YOU probably would have done the same thing. And it would have felt AWESOME! Jackson, at that moment, was deliriously happy. You stood there. You frowned. I thought about offering up the phrase “He’s autistic” as a way of explanation. You were not open to any information as far as I could tell. You turned smartly on your heel and walked away. My guess is that when you went home Jack and I became a dinner table story. A cautionary tale- perhaps a narration of bad parenting. And you know what? It’s OK. It really is. Because Jack and I know the truth– and we had a really great time.